Sunday roasts are everywhere over here. Sometimes you just can't walk down a high street without tripping over a blackboard special! But it's always the same old offerings: chicken, pork or beef. Now, I love the idea of Sunday bringing families and friends together over a lovely meal; chicken, pork or beef however, I really do not love. After doing some research, my bff-fellow-foody-partner-in-crime Anton and I went too Manna in Primrose Hill, after seeing that they offered a seasonal vegan Sunday roast. 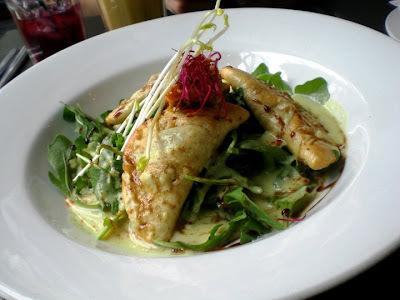 For starters, we ordered the crisped ravioli filled with wild mushroom & walnut pâté with fennel cream sauce, sundried tomato pesto & balsamic reduction. This was devine, and luckily also available as a main. 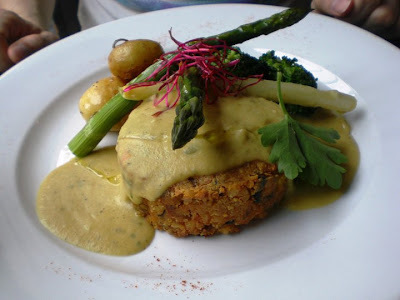 And of course, the Sunday nut roast with lentil sauce.